With a short road trip from most Southern California locales or a day’s drive from Nevada, Idaho and Northern California, Las Vegas, Nevada provides a fantastic Spring or early Summer getaway for roadtripping couples who crave excitement, glitz, upbeat dining, breathtaking shows, and thrill seeking Las Vegas style attractions. It seems almost every decade, Las Vegas evolves with a new facelift yet through the years it continually remains a fabulous couples travel destination, particularly for adventure seekers. The main drag that runs through the heart of the city is known as the Strip. There you will find much of the lifeblood of Las Vegas. If you are looking for deals, Springtime, Autumn, and Winter in Las Vegas offer excellent deals and promotions, generally great weather, as well as smaller crowds and more vacancies throughout the Entertainment Capital of the World. On our recent visit we stayed at the Stratosphere Casino, Hotel and Tower at the North end of the Strip. At 1,149 feet high, the tallest building in Las Vegas, the Stratosphere hotel is a fabulous choice for fun seeking adults when staying in Las Vegas. It’s also the only hotel to have its own amusement park on its roof. The views from the lounges, restaurants and looks outs are simply stunning and romantic. Recently, new attractions have been added to the top of the tower, including the Sky Jump, a scream-inducing leap from the 829 foot Tower and the highest controlled descent according to Guinness World Records. Couples can also try The Big Shot that blasts you 160 feet straight up into the air from the Tower and you can pull some G’s as you free fall back to the launch. Insanity The Ride will surely be next on the list for adrenaline junkie couples as its giant mechanical arm holds you both 900 feet high as you are spun 64 feet over the Tower edge. X Scream is your last chance at feeling a rush as participants are catapulted head first 27 feet over the Tower edge while dangling 109 stories above Las Vegas and are snapped back for more. If you both can find your stomach, the Stratosphere has it’s own upscale rotating restaurant in the observation tower at the top of the roof, where guests can eat, drink, and overlook the bird’s-eye view of Las Vegas’ lights. An outdoor pool and romantic cabanas are also offered on the 8th floor but there’s so much to do both day and night that you may never even make it to the pool. You don’t even have to leave the property to enjoy one of Las Vegas’ best shows. Many couples enjoyed the show called MJ LIVE as did we. Michael Jackson music is high energy and sultry and what better way to thrill each other but with the original Thriller? MJ LIVE is a phenomenal Michael Jackson tribute show that has rightfully so, won awards as the best in the world. 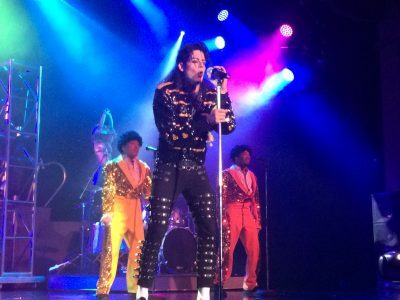 In the comfort and convenience of the Stratosphere’s own building, the MJ LIVE Tribute is the perfect show to see when you want to stay in the comfort of your hotel yet feel the excitement and quality of Las Vegas shows. With attention-to-detail choreography, singing, and outstanding lighting effects a Michael Jackson impersonator will make you feel like you’re at a real Michael Jackson concert. During the show, you can order from a variety of themed alcoholic beverages like Black & White and Human Nature. A visit to Las Vegas would not be complete without a Cirque du Soleil show. One of the best top-rated shows to see in Las Vegas is Mystere. As professional acrobats perform in the very aisles near your seats, it’s impossible not to get the full experience. This show is so elaborate, if you blink once you could miss it. The outstanding, intricate, enormous, and constantly changing sets, are utterly mind boggling and captivating. 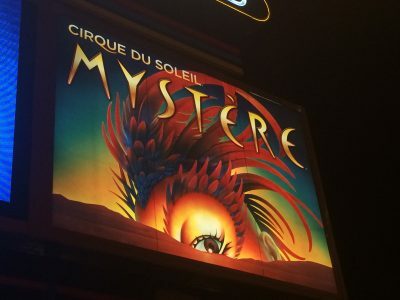 You’ll be gripping your seat the whole time while watching Mystere as the live music, acrobatics, avant-garde costumes, acting, masks, make-up, and imagery is astounding. You will gasp as actors and acrobats perform incredible feats over your head and in every corner of the auditorium. Dancing, climbing, trapeze, pole climbing, and body and mind bending positions will have you awestruck and forgetting to breathe for nearly two hours. You may eventually want to explore the Strip and away from the Stratosphere the options are endless day and night. For those who whetted their thrill seeking appetite atop the Stratosphere, there is The Roller Coaster for those who visit the New York New York Hotel & Casino. At 203 feet from the ground and going at a speed of 67 miles per hour, you will be turned upside down and likely scream with excitement from this spectacular experience. A replica of the famous tower, The Eiffel Tower Experience which is located at the Paris Las Vegas, is 165 meters tall and allows visitors to go up to its highest level to have a great view of the whole Strip. It’s definitely one of the most romantic views of Las Vegas right along with the Stratosphere Tower. And you can honestly, finally, tell everyone that you kissed at the Eiffel Tower. Las Vegas is not just the Entertainment Capital of the World but a mecca of thrilling delights for couples looking to dump some adrenaline. You can beat the heat and get the best deals by planning a trip there during the off season. While there is enough to keep a couple busy with entertainment for a week, it’s the perfect destination for an extended weekend as well.